We had such a busy weekend. We worked in the yard all day yesterday, getting our plants in and finally mowing the lawn after several days of rain. I even had a chance to work on my son's gift for his teacher. I can't believe school is done this week. Then it's time for summer break. Well for Ethan anyway. I'm so lucky and blessed to have my mom watch him over the summer. I know it's not easy for her taking care of Ethan and my Dad who has been in a wheelchair for almost 2 years now. Words can never say how much I love my mom. I mod podged some K&Co. 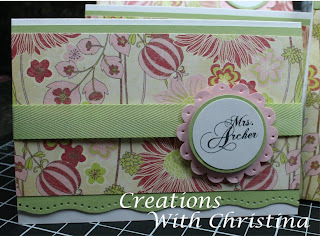 paper to the white tin box and added some Certainly Celery Stampin' Up! ribbon and printed my sons teacher's name on some white cardstock and punched it out. 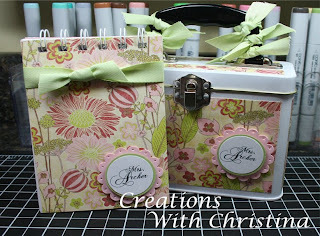 I also made a set of note cards to match and a notebook using my Bind It All machine. I still have a nother set of note cards to make in another style pattern paper. If you have a Bind-it-all machine and would like the instructions on how to make it, visit Robyn's Blog HERE. She made this during National Scrapbook Day and I just can't stop making them. Lucky, lucky teacher. This is a beautiful gift. Great job as always.